I usually store our seeds in the greenhouse or shed in an old chocolate tin. I always have problems, the tin rusts and rots or mice get in and eat them! Generally I just throw them away and buy more the next year. This year I'm trying to be more frugal, and I realised what a waste this was! I did buy some more seeds as they were being sold half price and I am determined that these will not end up having the same fate as my seeds of the past. To try and protect my seeds this year, I've used plastic storage boxes for vegetables and a small metal tin for flowers. 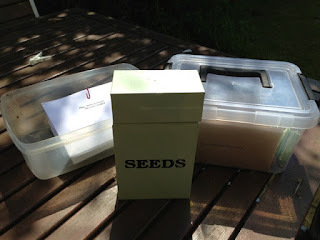 I used envelopes to store the seeds in and discarded everything from the original packaging except for the sowing instructions. I have ordered each pack in date order by month, some of the vegetables still need successional sowings over the summer so I've marked dates in my personal diary to remind me to sow. I haven't decided yet if I will add monthly markers or if I will develop this process further. 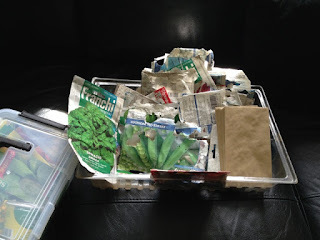 I do know that although I've grown vegetables and flowers for 20 years my method is still very haphazard and I am very aware I could be far more successful if my plans were more effective. I seem to spend so much time over-planning that I run out of time to 'do', this is something I'm working on in all areas of my life. These will be stored in the shed or garage. 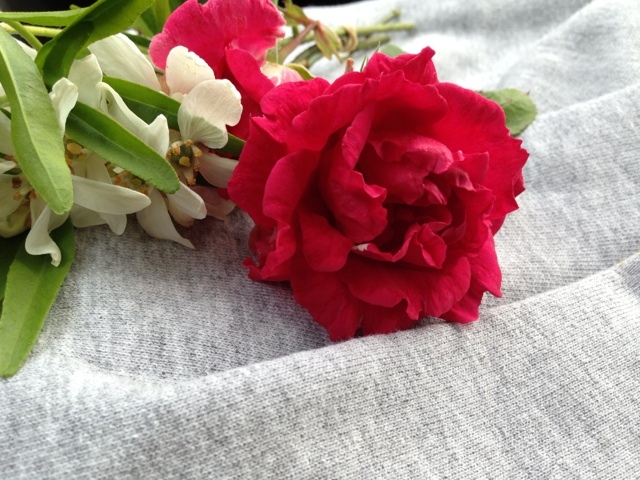 On anther note, the first roses flowered this weekend, just in time to take a couple to Tony's plaque at the crem for Father's Day. |LIFE BALANCE|where did those three weeks go?